Draft: 2008, Kansas City Royals, 2nd rd. Johnny Arthur Giavotella, Jr. (gia-voh-TELL-uh)...graduated from Jesuit (LA) High School in 2005...member of Louisiana 5A Baseball State Championship team...played linebacker on his high school team...attended University of New Orleans (LA)...hit .354 with 12 home runs, 56 RBI and 19 stolen bases as a junior...named Most Outstanding Player of 2007 Sun Belt Conference Tournament as UNO won title...following 2007 campaign, named by Baseball America as top sophomore second baseman in country... family owns and operates Gio's Pizza and Spaghetti in Metairie, LA, which opened in 1984. Spent majority of season with Triple-A Norfolk, batting .306 (102x333) with 43 runs scored, 22 doubles, four triples, five home runs and 45 RBI. Also appeared in seven games with Baltimore, recording one hit in 10 at-bats...Began season with at-least one hit in 11 of first 12 games, including two three-hit affairs, batting .327 (16x49) with six doubles, one triple and six RBI...Hit in season-long 14-straight games from May 26-June 8, batting .424 (25x59) with 12 runs scored, three doubles, three home runs and 10 RBI...Also had 11-game streak from June 19-29, batting .350 (14x40) with three doubles, one triple, one home run and eight RBI...Drove in four runs to mark season-best on May 17 vs. Gwinnett...Recorded season high with four hits on June 6 at Gwinnett... Had contract selected by Baltimore on July 6 and appeared in seven games before being designated for assignment on Aug. 1...Season was cut short due to hip injury sustained in early Aug. Spent majority of season with Angels in 2016, posting .260 average (90x346) with career-high six home runs over 99 games...Recorded career-high four hits on June 13 vs. Minnesota, going 4x4 with a double, home run and one RBI. Established career highs in nearly every offensive category during first season with the Angels... Hit .272 (123/453) with 51 runs scored, 25 doubles, five triples, four home runs and 49 RBIs... Became just the sixth Angels second baseman to hit .270 in a season with 25 doubles and five triples. Saw action batting 1st (39 G), 2nd (3 G), 5th (6 G), 7th (13 G), 8th (6 G), 9th (48 G)... Led the Majors with a .322 (48/149) average batting 9th (min. 150 PA) and tied Benji Gil's Club record (.322 in 2001) for average by a number nine hitter (min. 150 PA)... Club went 25-13 in his starts batting leadoff. Hit .301 (41/136) with 10 doubles and 19 RBI in the seventh inning or later, including a .365 (27/74) clip with 13 RBI in Late and Close situations... Was the highest average by a Halo in Late and Close situations since Garret Anderson's .371 clip in 2008 (min. 75 PA) and led the A.L. Missed 31 games from Aug. 24 (retro to Aug. 21) to Sept. 25 with a personal medical condition... After returning, hit .367 (11/30) with four doubles, two triples, a home run and nine RBIs (10 G)... Club went 7-3 in those contests... Club was 68-61 in games he appeared. Played in 12 games over three different stints with Kansas City, batting .216 (8/37) with a double, a home run and five RBI...Hit lone home run of season, a three-run shot May 11 in Seattle, helping KC to a 9-7 win...Appeared in 114 games with Triple-A Omaha, batting .308 (136/441) with 66 runs, 33 doubles, two triples, seven home runs, 61 RBI and 20 stolen bases...Tied for fourth in Pacific Coast League in doubles and tied for eighth in batting average...Designated for assignment Dec. 18, 2014 (RHP Kris Medlen added to KC 40-man). Johnny spent a majority of 2012 with Omaha (AAA), but played 53 games with the Royals over two stints...He recorded a solo home run to dead center on September 4 vs. Texas, his first long ball in the Majors since September 3, 2011 vs. Cleveland, a span of 185 at bats. Johnny got his first look at the Majors, playing 46 games for the Royals, after dominating the Pacific Coast League ... was named by the organization as the George Brett Hitter of the Year ... was a PCL All-Star starter and was leading all of minor league baseball with 153 hits at the time of his call up. ... Had his contract selected from Omaha on August 5 and made his debut that night vs. Detroit. ... Hit .333 (14-for-42) in his first 11 games and then batted just .221 (30-for-136) the remainder of the way. ... Underwent arthroscopic surgery in Vail, Colo., following the season to repair a labral tear in his right hip. Spent the entire season at NW Arkansas (AA) and helped guide the Naturals to the Texas League title...Ranked among the Texas League leaders in 11 offensive categories including pacing the circuit in hits andruns, tying for fi rst in games played; second in at bats, batting average and doubles; third in total bases with240, fi fth in on-base pct., sixth in walks, seventh in OPS at .855 and eighth in RBI...Named a starter at second base in the Texas League All-Star Game and also a league postseason All-Star...Following the season, competed for Surprise in the Arizona Fall League and hit .328 (21-for-64) with 10 doubles,2 home runs, 13 RBI and 11 runs scored in 16 games...played in the league's Rising Stars Game. Ranked among the Carolina League leaders in 2009 in games played (T1st), runs (2nd), triples (3rd), walks(fifth) and stolen bases (T7th). Joined Burlington in June, 2008 after signing and helped lead the Bees to a late postseason run and the Midwest League title. June 22, 2018 Charlotte Knights released 2B Johnny Giavotella. May 27, 2018 2B Johnny Giavotella assigned to Charlotte Knights from Birmingham Barons. May 18, 2018 Birmingham Barons placed 2B Johnny Giavotella on the 7-day disabled list. May 12, 2018 2B Johnny Giavotella assigned to Birmingham Barons. 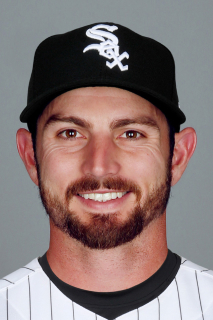 May 11, 2018 Chicago White Sox signed free agent 2B Johnny Giavotella to a minor league contract. May 2, 2018 New Orleans Baby Cakes released 2B Johnny Giavotella. April 17, 2018 New Orleans Baby Cakes activated 2B Johnny Giavotella from the 7-day disabled list. April 5, 2018 New Orleans Baby Cakes placed 2B Johnny Giavotella on the 7-day disabled list. February 8, 2018 2B Johnny Giavotella assigned to New Orleans Baby Cakes. November 28, 2017 Miami Marlins signed free agent 2B Johnny Giavotella to a minor league contract and invited him to spring training. October 2, 2017 2B Johnny Giavotella elected free agency. August 22, 2017 Norfolk Tides placed 2B Johnny Giavotella on the 7-day disabled list retroactive to August 21, 2017. August 7, 2017 Norfolk Tides activated 2B Johnny Giavotella from the temporarily inactive list. August 6, 2017 Norfolk Tides placed 2B Johnny Giavotella on the temporarily inactive list. August 3, 2017 Baltimore Orioles sent 2B Johnny Giavotella outright to Norfolk Tides. August 1, 2017 Baltimore Orioles designated 2B Johnny Giavotella for assignment. July 6, 2017 Baltimore Orioles selected the contract of 2B Johnny Giavotella from Norfolk Tides. February 7, 2017 Baltimore Orioles invited non-roster 2B Johnny Giavotella to spring training. February 2, 2017 Baltimore Orioles signed free agent 2B Johnny Giavotella to a minor league contract and invited him to spring training. February 2, 2017 2B Johnny Giavotella assigned to Norfolk Tides. October 10, 2016 2B Johnny Giavotella elected free agency. August 28, 2016 Los Angeles Angels sent 2B Johnny Giavotella outright to Salt Lake Bees. August 20, 2016 Los Angeles Angels designated 2B Johnny Giavotella for assignment. September 25, 2015 Los Angeles Angels activated 2B Johnny Giavotella from the 15-day disabled list. December 19, 2014 Kansas City Royals traded 2B Johnny Giavotella to Los Angeles Angels for RHP Brian Broderick. December 18, 2014 Kansas City Royals designated 2B Johnny Giavotella for assignment. November 21, 2014 2B Johnny Giavotella assigned to Tiburones de La Guaira. October 30, 2014 Kansas City Royals activated 2B Johnny Giavotella. September 30, 2014 Kansas City Royals reassigned 2B Johnny Giavotella to the minor leagues. September 1, 2014 Kansas City Royals recalled 2B Johnny Giavotella from Omaha Storm Chasers. May 20, 2014 Kansas City Royals optioned 2B Johnny Giavotella to Omaha Storm Chasers. May 9, 2014 Kansas City Royals recalled Johnny Giavotella from Omaha Storm Chasers. April 12, 2014 Kansas City Royals optioned 2B Johnny Giavotella to Omaha Storm Chasers. April 9, 2014 Kansas City Royals recalled Johnny Giavotella from Omaha Storm Chasers. March 25, 2014 Kansas City Royals optioned 2B Johnny Giavotella to Omaha Storm Chasers. September 3, 2013 Kansas City Royals recalled Johnny Giavotella from Omaha Storm Chasers. July 18, 2013 Kansas City Royals optioned Johnny Giavotella to Omaha Storm Chasers. June 30, 2013 Kansas City Royals recalled Johnny Giavotella from Omaha Storm Chasers. March 23, 2013 Kansas City Royals optioned Johnny Giavotella to Omaha Storm Chasers. August 18, 2012 Kansas City Royals recalled Johnny Giavotella from Omaha Storm Chasers. June 12, 2012 Kansas City Royals optioned Johnny Giavotella to Omaha Storm Chasers. May 9, 2012 Kansas City Royals recalled Johnny Giavotella from Omaha Storm Chasers. March 25, 2012 Kansas City Royals optioned Johnny Giavotella to Omaha Storm Chasers. August 5, 2011 Kansas City Royals selected the contract of Johnny Giavotella from Omaha Storm Chasers. March 31, 2011 Johnny Giavotella assigned to Omaha Storm Chasers from Northwest Arkansas Naturals. January 3, 2011 Kansas City Royals invited non-roster 2B Johnny Giavotella to spring training. August 31, 2010 Johnny Giavotella assigned to Surprise Rafters. April 1, 2010 Johnny Giavotella assigned to Northwest Arkansas Naturals from Wilmington Blue Rocks.